The company has last week launched two new price plans, Rs 199 and Rs 299, with 30% higher Average Revenue Per User. Reliance Jio, which has disrupted Indian telecom market since its inception, is likely to continue the pressure by making another steep price cuts in its most popular plans. RJio has cut ARPU by 10% to 25% (Rs 50 – Rs 60) in its four most popular price plans namely – Rs 198, Rs 398, Rs 448 and Rs 498. All the plans offer 1.5GB data per day to customers. Now, the Rjio's Rs 198 plan would offer 42 GB data for 28 days period, Rs 398 plan would give 105GB data in total for 70 days, Rs 448 pack would sanction 126GB data for 84 days and Rs 498 pack would provide 136GB data in all for 91 days period. Last week, the company has also launched two new price plans, Rs 199 and Rs 299, with 30% higher Average Revenue Per User (ARPU). According to Motilal Oswal, RJio management has indicated about ARPU accretion to improve profitability. Reliance Jio's net loss widened in Q2FY18 at Rs 270.59 crore compared to net loss of Rs 21.27 crore in Q1FY18 and net loss of Rs 3.90 crore in Q2FY17. RJio has completed one year since its launch in September 2016. The company's revenue from operation now stands at Rs 6,147.06 crore by end of September 30, 2017. RJio since inception has created a disruption in telecom market, damaging fortunes of other incumbent operators with free offers and sharply discounted plans. While small telecom firms chose to consolidate with bigger ones, aggressive pricing offering data war still remain between RJio and its rivals, including Bharti Airtel, Vodafone and Idea Cellular. 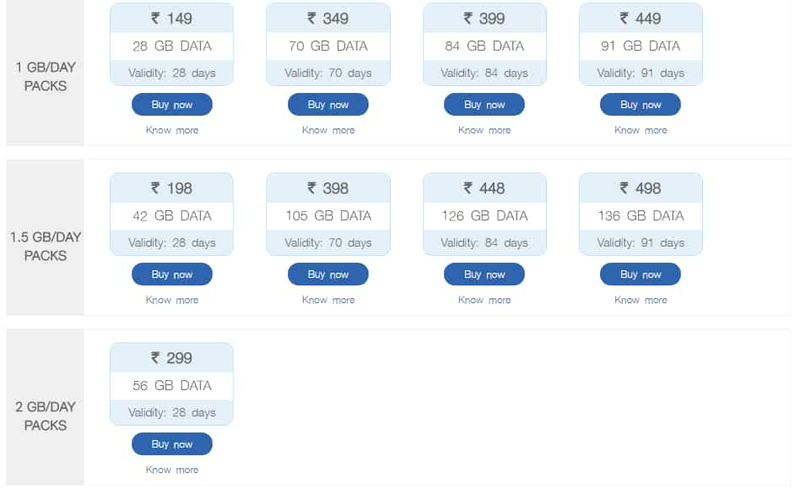 Recently, Bharti Airtel and Vodafone launched plans offering unlimited voice and 1GB data per day for 80-90 days period at price ranging between Rs 450 and Rs 500. However, these offers by rivals are at premium of 11-15% compared with Rjio. While Idea Cellular's plans are at 23% premium. Aliasgar Shakir and Hafeez Patel, Research Analysts at Motilal Oswal, said, "We believe the move is intended to eat into the subscriber market share of small vulnerable players like i) Tata Tele and Telenor before they merged with Bharti, and ii) RCom and Sistema as they plan to shut operations over the coming 6-9 months." "Given that most of subscribers with smaller operators are deal-hunters with low ARPU of Rs 100-120, RJio may plan to attract them before they shift to Bharti and Idea," the duo added. Tanu Sharma, Associate Director at India Ratings, said, "The recent price cut by Reliance Jio Infocomm Limited will delay the prospects of a recovery in incumbents’ average revenue per user (ARPU) level." "The price cut indicates pricing discipline may still be uncertain and highly dependent on consumer behaviour despite consolidation in the industry paving the way for long-term structural improvements," Sharma added. During Q2FY18, two large telecoms registered an ARPU decline of 25% on yearly basis, as per Ind-Ra. At the same time, RJio reported a higher ARPU of Rs 156 for 2QFY18 than the Rs 84 recorded for the industry for the period, as RJio’s entire customer base comprises broadband data subscribers. It may be noted that broadband data subscribers constitute only 20% of the customer bases of other large telecoms. Non-broadband subscribers are typically low ARPU-generating customers. Talking on company specific, Motilal pointed out that Bharti and Idea’s 3QFY18 ARPU is estimated at Rs 127 and Rs 116, with ~25% data subscribers and average data subscriber ARPU of Rs 200 and Rs 175 (implying 25-30% higher data ARPU compared to their popular price plans). They, however, cautioned saying that the move by RJio could lead us to revise our ARPU estimates of 15%/10% growth for 4QFY18/FY19 for Bharti and Idea. Ind-Ra believes that top telcos would focus more on increasing their subscriber market share than revenue market share during 2018, and the dual sim phenomenon would continue for longer-than-expected given low customer loyalty and high price sensitivity. The industry pricing trend is moving towards competitive pricing on long validity plans (70-90 days) to increase customer stickiness, Ind-Ra added.